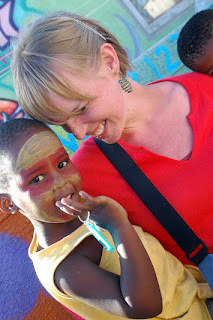 Howard journeyed last year to South Africa to paint, write, teach and create. She returned with a magnificent work of art, "A Warm Space to Disappear," which is a compilation of Howard's sketches from her residency in Cape Town. This experience and the rave reviews inspired her to go bigger in 2013. "During the 13/13/13 Sketchbook Project, Catherine J Howard will live with 13 collectives of artists that use visual art to challenge and revitalize their communities -- from Tampere, Finland where artists band together to weather a harsh physical and economic environment to Karachi, Pakistan where artists are working under-the-radar to promote critical thinking about the implications of combining religion and materialism to Asuncion, Paraguay where street artists are invigorating shanty towns with color and pride. To document and disperse these experiences, she will publish sketchbooks..."
She intendeds for these sketchbooks to include everything from writing and drawings, to collage, to photographs and perhaps even Polaroids. Naturally, she is going to blog about her travels, as well. Her South Africa blog was riveting. After a year roaming the globe, Howard intends to distill the lessons learned of her journeys into an educational curriculum for distribution to art educators and social activists all over the world to help reverberate the waves started by her 13/13/13 Sketchbook Project. We applaud. And we encourage you to come out to Mercury Studios tonight between 6pm and 9pm, at 407-A Mangum Street to help support Catherine and Art. Gary Kueber and "Untold Durham"